Caliber: American weapons use inches for caliber, whereas Europeans use mm. For example, the .30-.30 has a caliber of 0.30 inches = 7.62 mm. Carbine: usually shorter than a rifle and of lower velocity. Photogrammetry: determination of the geometric properties of objects, based on photographic images. Stereophotogrammetry: estimating the 3D coordinates of points on an object via measurements from two or more photographic images, taken from different directions. 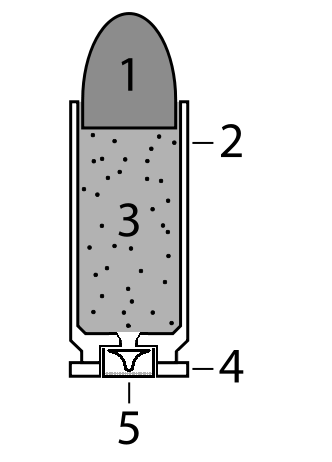 the primer, which ignites the propellant. Analyses of the acoustic evidence do not demonstrate that there was a grassy knoll shot, and in particular there is no acoustic basis for the claim of 95 percent probability of such a shot. The acoustic impulses attributed to gunshots were recorded about 1 minute after President Kennedy had been shot and the motorcade had been instructed to go to the hospital. …features of the recorded sounds strongly suggest that the open microphone was not in Dealey Plaza at the time of the assassination. The impulses selected for the BRSW study were not always the largest ones. …weak spikes on the Dictabelt often are selected to correspond to strong patterns in the test patterns, and vice versa. No siren sounds are heard on channel I at a time when they should have been heard by an open microphone in the motorcade; sirens are not heard for approximately 2 minutes…. James Bowles, police communications supervisor at the time of the assassination, suggests that it [the stuck microphone] was on a motorcycle parked at the police command post near the Trade Mart, where it would be natural to have adjacent police radios tuned to different channels. Furthermore, even if it were granted that the hypothesis of randomly located impulses on relevant portions of the tape were in serious doubt, it would not follow that the alternative of gunfire from the grassy knoll was convincing. All plausible alternatives to both of these hypotheses would have to be eliminated, and no convincing effort has been made in this direction. …the "hold everything" segment of channel II is present on channel I at the same location as the acoustic impulses [i.e., suspect gunshots]. These different forms of evidence are all compatible with the recordings [of sounds] made at the same time [i.e.,"…Hold everything secure…" and the suspect gunshots], and some are incompatible with the hypothesis of later superposed recordings by audio or direct electrical coupling. …the Committee on Ballistic Acoustics unanimously concluded that the acoustic impulses attributed to gunshots were recorded about 1 minute after the President had been shot and the motorcade had been instructed to go to the hospital…. H. B. McLain. See JFK: First Day Evidence 1993, Gary Savage, pp. 265-279 and pp. 313-410. The latter pages are actually by James C. Bowles (1979) and consist of his comments, along with detailed transcripts of both Ch-1 and Ch-2. Also see HSCA 180-10107-10184: staff interview of Hollis B. McLain, September 26, 1977 and 5 HSCA 629 and 5 HSCA 630. Vincent Bugliosi, Reclaiming History 2008, Endnotes 381. R. Linsker and R. L. Garwin, "Synchronization of the acoustic evidence in the assassination of President Kennedy," Science & Justice, Volume 45, No. 4 (2005) 207-226. D. B. Thomas, "Correspondence received in relation to LG: ‘Synchronization of the acoustic evidence in the assassination of President Kennedy,' Science & Justice, Volume 45, No. 4 (2005) 207-226." The angle of deflection for three different bullet types, through aluminum, brass, and steel of thicknesses 1/16" and 1/8," ranged from 30 to 66 º, with the highest value for brass. For wood, the corresponding angles ranged from 12 to 36 º, depending on the bullet type. Interestingly, in wood the 7.65 bullet gave the highest deflection (of 36 º). Ribs produced rather little deflection. None of these data, in my opinion, seem pertinent to the case of a bullet striking a skull, so it is not clear why Thomas cites this paper at all. Sellier also cites work done on deflections from concrete, asphalt, and grass. These data might be germane to the bullets that struck the street surface in Dealey Plaza, but Thomas does not open that door and I have likewise not explored it. Interestingly, Sellier cites work by M. Jauhari: "Bullet ricochet from metal plates," J. Crim. Law Pol. Sci. 60, 387-394 (1969). Since this paper is in English, and appears to be the actual source of the metal deflection data (discussed by Sellier), it is odd that Thomas did not explicitly cite it. Another English language paper not cited by Thomas (but present in Sellier's bibliography) is this one: "FBI: Bouncing bullets." FBI Law Enforcement Bulletin, S. 2-6 u. 20-23. Washington, Sept./Okt. 1969. This is the paper that tests deflections from concrete, asphalt, and grass. One can only wonder if that work was triggered in part by the bouncing bullets in Dealey Plaza. 2 4 "miscellaneous short segments"
The recording stopped, typically after 4 seconds of silence (in either channel). Skips or repeats occurred during recording (Ch-2, Gray Audograph). Playback caused skips or repeats (Ch-2, Gray Audograph). A standard phonograph table (for Ch-2) was required for playback. The police tape playback speed (Ch-1) was 5% too fast. Crosstalk events might be misidentified. Note: See details in Table 1 by LG (reference 5 of my Appendix 4)—or Table 1 or Table 2 from O'Dell (shown in this review). Note that GO (by Curry) is not a crosstalk. 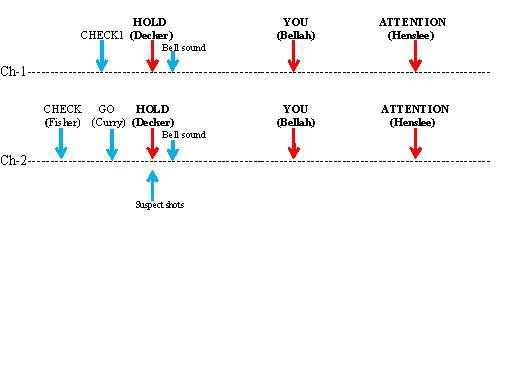 CHECK1 and CHECK are two different utterances at two different times, so they cannot represent crosstalk. ATTENTION was a deliberate simulcast, but it is not very useful for establishing a timeline because it occurs so late. The suspect shots overlap with HOLD on Ch-2. They are not heard on Ch-1. Thomas's notation is used here, except for CHECK1, a label that was introduced by LG in order to distinguish it from CHECK. Red arrows indicate authentic crosstalk sounds. Bellah actually consisted of two closely spaced utterances, but only one is shown here. This sketch is not designed for precise intercomparison of the two channels (for either the times or the intervals), nor is it to scale.